The United Nations agency coordinating the fight against H.I.V./AIDS, UNAIDS, has come under criticism for a recent downward revision of the number of people living with AIDS worldwide. According to the revised estimates, 33.2 million individuals now live with AIDS instead of the 2006 estimate of 39.6 million. 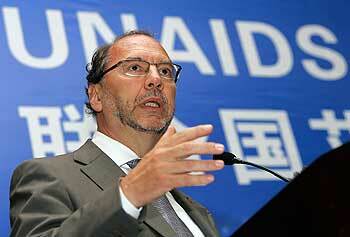 Critics of UNAIDS have accused the agency of raising the prior estimate as a tool for mobilization and fundraising. In response, the UNAIDS explained that the revised estimates came principally from better epidemiology and statistical analyses, a better idea of the natural history of the global epidemic, from more population-based surveys on H.I.V. prevalence in key countries at the forefront of the fight against AIDS, from the findings from a recent population-based survey in India that cut estimates there by nearly half, and from revised estimates from Nigeria, Kenya, Angola, Zimbabwe, and Mozambique. In light of the pandemic, the revised estimate is a welcome development for a number of reasons. First, we now know that the UNAIDS can readily admit when it has been wrong on data and make transparent corrections. Second, the fight to contain the global epidemic is not as insurmountable as previously thought, since the revised estimates also suggest that new H.I.V. transmissions may have reached a peak in the late 1990's, and is beginning to level off in some countries. Third, the revised estimates have now pushed to the forefront the need to conduct national population-based surveys and continuously refine analytical tools. Fourth, a more accurate estimate of the number of individuals living with H.I.V./AIDS, and of those not likely to be infected, creates unique opportunities for political leaders and policy makers to plan better for a more effective and credible response in their countries and regions. It is important to note that the revised estimates do not fundamentally alter the extraordinary impact of H.I.V./AIDS. Today, even with revised estimates, the number of people living with H.I.V./AIDS worldwide is staggering. The number of individuals living with H.I.V./AIDS is more than half the population of the United Kingdom or France or Italy. There are more people today living with H.I.V./AIDS than there are people living in the states of New York or Texas. The southern region of Africa represents 2 percent of the global population but accounts for 35 percent of all individuals living with H.I.V./AIDS worldwide, according to the revised estimates by UNAIDS. Today, 6,800 individuals will likely contract new H.I.V. infections and 5,700 will die of AIDS. These individuals and their families are not numbers for debate or argument. They are the loved ones of real families, real neighborhoods, and real communities. They are our fathers, mothers, sons, daughters, nieces, and nephews. Many more individuals will contract H.I.V. or die of AIDS in the coming years if enough resources are not made available to mount effective prevention programs, provide treatment with lifesaving antiretroviral drugs, and provide social support at family and community levels. Those who die of AIDS today will leave a huge void in the lives of their loved ones. Their communities will be cheated of their potential contributions. The war against AIDS remains as challenging and as complex as ever. We should welcome better estimates of those living with H.I.V./AIDS. We should also continue to mount a credible, effective, and comprehensive global response.